After nearly three years of working on Wyldwyck River Camp, Glasco resort was granted conditional approval. To be built, it still needs time to satisfy the required conditions. Photo courtesy of Agawam Hospitality Group. 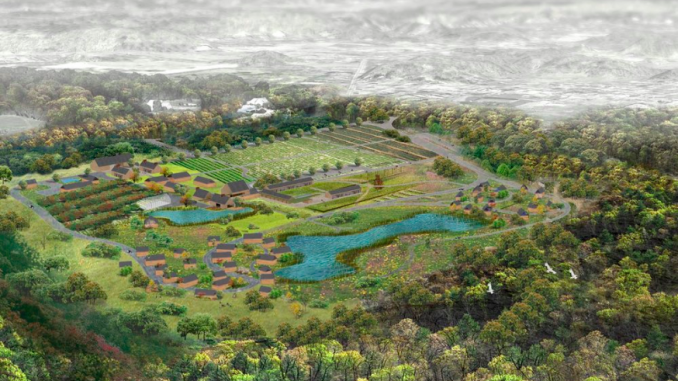 What do you get when you add up 82 acres, 72 rooms and a 120-seat farm-to-table restaurant? Conditional approval for Wyldwyck River Camp. On Jan. 15, Agawam Hospitality Group’s proposed restaurant and resort in Glasco took the next step in becoming a reality after nearly two years of plan alterations, two public hearings and a series of comments from Ulster County government. Complete with woodsy cabins, agricultural fields, artists’ studios and horse-riding stables, “Wyldwyck is a new paradigm for the fast-growing experiential tourism market,” claimed the Agawam Hospitality Group’s website. Saugerties is a historical town nested along the Hudson River, providing Wyldwyck River Camp with a perfect homage to the rich Dutch history of the region. In January, the Saugerties town planning board approved a six-page resolution for Wyldwyck River Camp. The major concerns expressed by Saugerties citizens and the planning board members included the Wyldwyck River Camp’s traffic, public access and gravel roads, but the origin of these concerns really boiled down to safety. The main entrance to the project site is located 600 feet east of the intersection of New York State (NYS) Route 32 and Glasco Turnpike. While it is unclear whether this intersection is prone to traffic congestion or accidents, the people of Saugerties worried about what the increased traffic will result in. Along with adding a second entrance, a traffic study was prepared to determine whether or not the increased traffic flow would be problematic, which was then reviewed by an independent traffic consultant and the NYS Department of Transportation to confirm the accuracy of the findings. “The studies showed that the increased traffic would not change the level of service at the intersection and that a traffic light was not needed,” Utter said. The developers’ plan to implement gravel roads on the resort in order to achieve a rustic farm look was also met with reluctance. Community members worried that the gravel roads would not be able to carry the weight of emergency vehicles—particularly fire trucks. To compromise, the developers applied a stone and seal surface to the main entry road and the handicapped parking areas. The resort will also need to comply with the State Building Code with regards to fire sprinkler systems and fire hydrants. To accommodate the concern of the resort’s public access, the resolution plan included no more than two events per week and limits on noise levels at these events. “The plans have been updated with a gate on a woods road on the property as well,” Utter added in a Hudson Valley One article. While it’s only human for people to not want change and prefer their space to be left in its current state, there were many Saugerties community members who gave the resort their stamp of approval. According to Utter, the people of Saugerties would ultimately prefer to see the property developed with “low impact or light density use,” rather than seeing another monstrous residential development. “In fact, I personally had more people from within the Town of Saugerties who came up to me stating they were in favor of the project and hoped it would succeed than people who were against it,” Utter said. Even though the Saugerties planning board approved the resort plan, it is only conditional. Developers have been working on Wyldwyck River Camp for three years, and there still seems to be no end in sight for meeting the conditions of the approval.